If you are in a brownie rut, you have to try these! 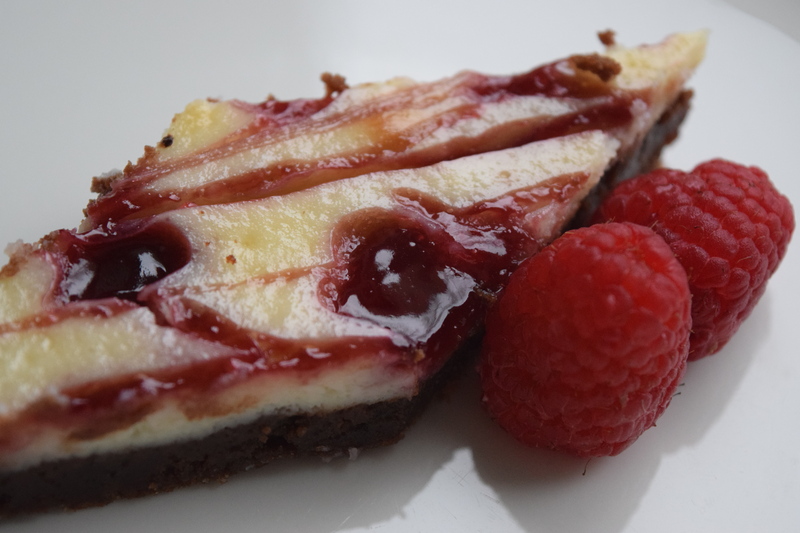 Chocolaty goodness on the bottom, decadent cheesecake on top, and a lovely contrast of rich, red raspberry, swirling throughout. 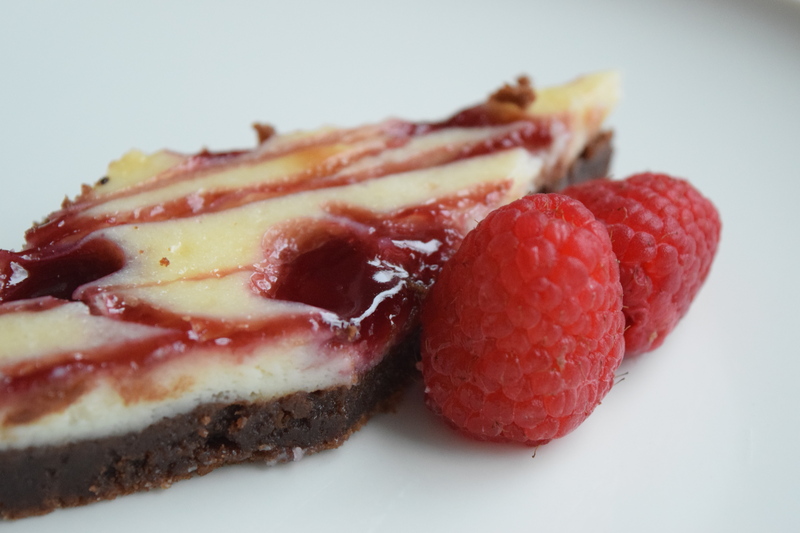 TIP: You want to avoid browning the cheesecake layer of the brownies or you won’t get that contrast between the red raspberry and creamy cheesecake. Try placing the pan on the lower rack of the oven. This will cook the brownies through, without browning the top. Preheat oven to 350F. Line an 8×8 inch square baking pan with aluminum foil and lightly grease. In a small, heatproof bowl, melt butter and chocolate together. Stir with a fork until very smooth. Set aside to cool for a few minutes. In a large bowl, whisk together sugar, eggs and vanilla extract. Whisking steadily, pour chocolate mixture into sugar mixture. Stir until smooth. Sift flour, cocoa powder, and salt into the bowl and stir until just combined. Pour into prepared pan and prepare cheesecake mixture. In a medium bowl, beat cream cheese, sugar, egg and vanilla extract until smooth. Drop in dollops onto prepared brownie batter. Smooth with a spatula. Drop dollops of raspberry preserves into the cheesecake. Gently swirl cheesecake batter with a knife. Only swirl the jam into the cheesecake batter, don’t try to bring it into the brownie layer. Bake for 35-40 minutes until brownies and cheesecake are set. A knife inserted into the cheesecake mixture should come out clean and the edges will be lightly browned. Cool in pan completely before slicing and serving, either at room temperature or chilled. Brownies can be refrigerated covered, for several days. Makes 20 brownies. Tags: brownies, cheesecake, cheesecake brownies, Dessert, raspberry cheesecake brownies. Bookmark the permalink. This looks amazing! Love the colour combination! This is a definite copy and keep recipe, thanks!